I love the humility lesson in The Grouchy Ladybug along with the friendliness of the friendly ladybug despite the attitude of the grouchy ladybug. I like to think that at the end of the book the Grouchy Ladybug becomes friends with the Friendly Ladybug. They also help the leaf by eating all the aphids. Saying thank you when a friend shares and thank you when someone helps us shows appreciation to our friends or acquaintances. To show the end of the book relationship, Sweet P created 2 ladybugs and a leaf w/ aphids on it. 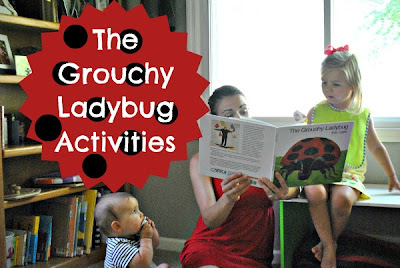 The Grouchy Ladybug had a down-turned mouth and frowny eyebrows to show the difference between the two ladybugs. She chose pink for the Friendly Ladybug and red for the Grouchy Ladybug. Because she wanted to paint with green and yellow, she used both on the leaf. I set the plates outside to dry while Sweet P played for a bit. When I brought them back in she glued on eyes, mouth and eyebrows. I was going to have her poke through the plate with a pushpin to make a hole for the antennae, but the plate was wonky and she had a hard time so I did it. 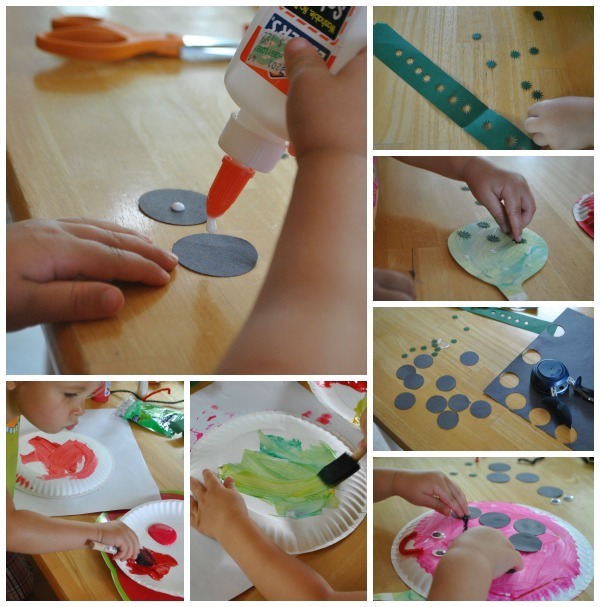 Using a circle cutter with a grip, she cut out 10 black circles for ladybug spots. We used a sunburst hole punch for the aphids, but it was too hard for her to push. I even had a hard time! I punched out 10 aphids for the leaf. To finish, Sweet P glued the spots on the ladybugs and counted the 10 aphids before gluing them to the leaf. I set them together to take a quick photo and she rearranged them so that the ladybug mouths were touching the leaf so they could eat! Here's what Baby Blue was up to while Sweet P glued!